"Mike Angelo" for your event! Mike Angelo the amazing speed painter brings History to life! With large scale images of US Presidents, Icons in History and even your own custom ideas surrounded with musical selections and video backgrounds round out this multi-dimensional performance. Always age appropriate, always informative, always funny, this artist and history geek is truly a renaissance man. Mike has excelled on stage in numerous circus and comedy related areas - a refreshing twist to history and fun. "What an incredible entertainer Michael's shows are always the highlight of our February stay here at Rocking Horse Ranch. 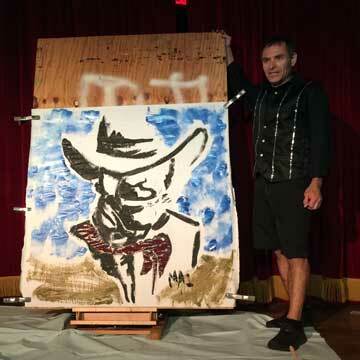 The presidential paintings were a hit and his eccentric comedy kept us entertained, never tired and always guessing. Hearing the audience gasp when you turned over the completed work and revealed the portrait all was the icing on the cake to a wonderful performance."